What makes Beng Mealea a must see when you go to Cambodia? I have been to Siem Reap in Cambodia several times but this was my first chance to see Beng Mealea. ​This so-called jungle temple turned out to be spectacular not just to me but to my Cambodian companions whose awe in what they saw was twinned with a very visible pride for this priceless heritage. Luckily for us, one of our companions started a conversation with a local temple guard who shared with us the story of his own growing up in the village. About 30 to 40 families lived there and all of them knew of the temple but they never ventured close for fear of snakes, land mines and spirits. Some brought offerings but not really inside. ​These days, the snakes may still be peeking out but at least the land mines are gone. Here's a video by Sou Davy of a portion of the Temple. The public was only allowed to Beng Mealea in 2005. But it wasn't long until the tourist tide flooded in. But it really reached stardom when the film, Two Brothers, chose this location. The film featured two tiger cub brothers who had been separated and were then reunited after an amazing adventure. Filmed in Beng Mealea, this movie is the story of two brothers who were separated and their journey towards reunification. 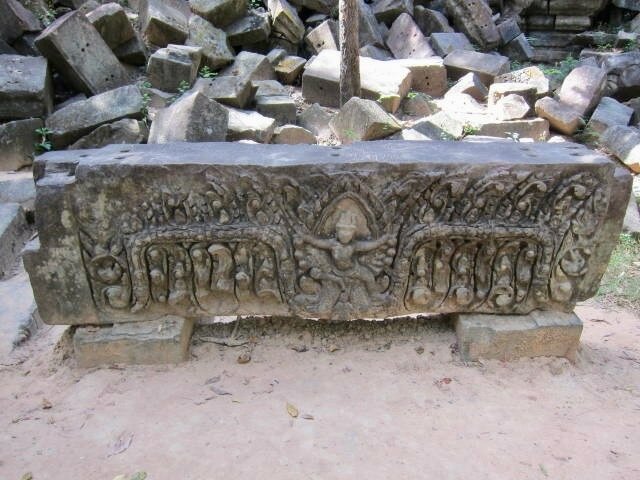 Carvings show Vishnu, Shiva and Buddha. Also, the apsaras and the Churning of the Milk lake. The scenes are smaller than those depicted in Angkor. According to the villagers, this largely uncleared Temple, crafted in the 11th or 12th century, was located on a lake. Some said it was built as a burial place. Not much is known about Beng Mealea so up to now, it is cloaked in mystery. Much of it, though, will continue to remain in mystery, forever buried in its ruins.